Our team of professional shippers of fine art is happy to offer a complete range of art shipping services in Miami, Florida. We have regular art shuttles going from New York City to Miami, and we also provide our clients with custom art shipping, art packing and crating, art storage, and art installation services all over the Miami metropolitan area. 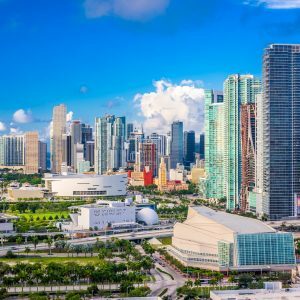 At Fine Art Shippers, we love working in South Florida, especially during Miami Art Week and other important art events happening in this part of the United States all year long. February is no exception, and in this blog post, we want to tell you about the most interesting events to be held in Miami this month. First of all, Miami will host the renowned Art Wynwood on February 14-18. Our fine art shipping company will be there to help galleries, dealers, artists, and collectors with art logistics, and we would definitely recommend visiting this international art fair to everyone! As for other art events to be held in Miami in February, you do not want to miss the following three! The Coconut Grove Arts Festival is a three-day outdoor event filled with fine arts, fun outdoor entertainment, live performances and music, exquisite food, and local flavors. The 2019 edition of this annual festival will be held in the charming village of Coconut Grove during Presidents Day Weekend, on February 16-18. III Points is a music, art, and technology festival combined in one. Held in the trendy Wynwood neighborhood, it is aimed at showcasing local artists from a variety of disciplines along with Miami’s up and coming music acts. This year, III Points will be held on February 15-17, bringing together some of the world’s best artistic and musical minds. Fuego Music Festival is a world-class Latin music festival and a must-visit event if you want to see an array of live acts celebrating the best of Miami’s Latino culture performed on an outdoor stage. It will take place at Mana Wynwood Convention Center on February 23-24. These were the best Miami events and festivals to visit this month! Please do not hesitate to contact Fine Art Shippers if you need art shipping, art installation, or any other art logistics help! You will love our attractive prices and excellent customer service!